Barack Obama showed up for tonight’s debate and achieved a decisive, and necessary, victory after his poor showing two weeks ago. Romney was often incoherent as he avoided answering questions. He set a new record for flip-flopping as he contradicted himself on jobs in the same debate. Romney argued both that the government doesn’t create jobs and claimed he would create jobs. His stock answer to many questions was “I know how to do that” without ever saying how. He later gave a variation, claiming he has done things for the economy in Massachusetts. If that is the case, why was he a one-term governor, and why is he trailing Obama by over twenty points in Massachusetts? Romney outright avoided answering questions such as whether he supported equal pay for equal work (in the past opposing this). He hid from his past positions opposing reproductive rights. Candy Crowley chastised Romney for failing to answer the question about assault weapons. Romney thought he was going in for the kill, repeating the right wing spin on Libya. Unfortunately for Romney, Crowley was in the Rose Garden when Obama did mention terrorism the day after the attack. Obama demonstrated that Romney has adopted views far to the right of George Bush, and Romney even gave him the opening to challenge Romney on his 47 percent comment. Yes, Obama is fighting back this time, exposing Romney lies. How many are so gullible as to fail to realize that Romney’s cuts on capital gains and dividends is a break for people like him? Romney is debating like Joe Biden, except without the facts. Question on women’s pay goes to an Obama strength. To be fair the next question should be a multi-millionaire asking how each candidate how they would help the rich get richer. Why wasn’t this Obama around two weeks ago? Finally got a chance to remind everyone that Osama bin Laden is dead. Ask anything and Romney will reply with “I know how to do that” without a single detail. Romney will increase jobs. Romney is creating a need for many new fact checkers in this debate alone. Shocking. Romney got his numbers wrong. Fact check: A closer look at Romney’s claims on Obama jobs record. If this was a sit-com, Obama would be doing so well that he would be ending all his responses with Bazinga or Legendary. Can’t wait to see how Fox spins this as a Romney win, or even claims that Romney had any sensible answers tonight. Two arguments which are not winners for Republicans: Libya and Fast & Furious. Only the right wing echo chamber follows these arguments. Candy pointing out that Romney not answering questions re assault weapons ban, and pointing out how he changed is position. If Romney has really done these things, how come Mass. voters don’t want him? Romney’s new math on jobs doesn’t add up. John Kerry doing a great job of tearing apart all of Romney’s arguments on CNN right now. The big question is the degree to which this turns things around. Obama appeared to have a sure victory going into the first debate. The combination of a poor debate style and repeated news reports of his loss gave considerable momentum to Romney over the past two weeks. 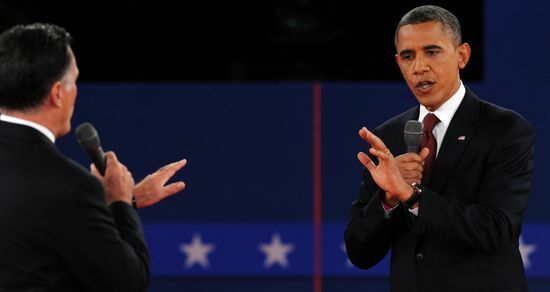 I fear that the poor impression from the first debate will still cost Obama some votes, but the second debate should shore up Obama’s lead in key states such as Ohio. The Democratic candidates have now won two out of three debates, with one left to go. Posted in Barack Obama, Blogs & Social Media, Economy, Mitt Romney, Terrorism. Tags: Barack Obama, Facebook, Mitt Romney, Twitter. RSS feed for comments on this post.. TrackBack URL.